Over the last few months, I’ve been interviewing amazing individuals about simple living, location independence, financial freedom and more. Every Thursday, a feature interview is posted on RowdyKittens. Last week, I chatted with Victoria Vargas of Smaller Living. This week I spoke with by Chloe Adeline, of Simple Rabbit Society. We talked about her minimalist journey, finding happiness, and starting her own small business. Tammy: Can you tell us about your blog, Simple Rabbit Society? 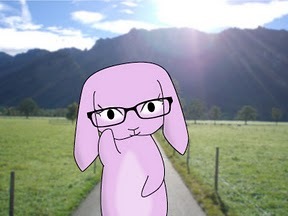 Well, the Simple Rabbit Society is focused on how we can live more exciting and more joyful lives through minimalism and simple living...but it's also really damn cute! 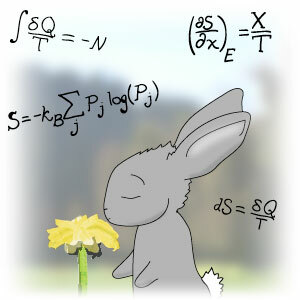 Free bunny drawings in every article! I just try to keep up. Chloe: A year ago I lived in a 12x12 foot apartment so tiny that my stuff sat in boxes, stacked against the walls to the ceiling like a game of 3d Tetris. It was like I lived in a play fort made out of moving boxes and foot lockers...for an entire year. Last winter I moved and when I looked at all my moving boxes, it was like waking up from a stupor. I realized that most of the stuff I had just moved hadn't been opened in over a year...some in three or four. I was just hauling around a bunch of stuff, apartment to apartment. I had even forgotten what was in most of the boxes! So one day, I promised myself I would get rid of half my stuff, which I did within two weeks. Then, I promised myself I'd do it again, which took a few more weeks. It was an exciting and liberating month for me—the beginning of my minimalist journey! Tammy: How do you define minimalism? Okay. In all seriousness, I think that a pretty good way to go about living is to focus on whatever is important to you so ruthlessly, that everything else is neglected, forgotten, and crumbles to pieces in the wake of your awesomeness! This is easy to say and tough to actually do...so minimalism is a tool we can use to help make this focus happen! Minimalism is when you intentionally take everything that's not important to you or essential and remove it from your life. Minimalism is also when you decide that fewer of your priorities will be priorities to you. It's about fewer distractions so you can focus on priorities. It's about fewer priorities, so the ones you keep truly stand out as priorities and receive their due attention and energy. Minimalism is also not just about stuff. "Stuff" is the obvious culprit. But minimalist principles apply to every aspect of life...from our calendars, to our emotional universes, to our social social and professional lives, etc. There are many benefits and opportunities that minimalism can create for us. For some it's location independence because we can pack our world into a backpack or car trunk. It increases our ability to become self-employed since we need less income to survive. And for some, it just makes life less stressful, more interesting, and more fulfilling. Chloe: I think that quitting clutter is a little like quitting any addiction. You should deal with the root issue as you start, and you need to replace your clutter with something healthy, or else junk will slowly collect back up in your life. I think a great first step to start decluttering is to read websites and books on minimalism. Not for the "how-to" aspect so much as the inspiration and absorbing the mindset. If you develop a distaste for clutter, are inspired by other people, and have the benefits of owning and doing fewer things fresh in the front of your mind, you'll have a much easier time of it. You'll be itching to toss stuff that's been holding you back! Of course, this doesn't actually ACCOMPLISH any decluttering. It just sets the stage, so make sure you actually do get to it! Tammy: I loved your recent post “How I Accidentally Doubled My Income And Became Self Employed In Three Days,” which talks about growth, risk taking, and your journey toward self-employment. What inspired you to leave your day job? Chloe: Aw thank you so much! Well, besides what I wrote in that article, I would say the main inspiration for leaving my j-o-b were others who I saw succeeding without one. People like Everett Bogue, Karol Gajda, Colin Wright, and maybe you've heard of Tammy Strobel, etc. But more than any of these...and I'm completely serious...was Loy. I haven't told many people this, but she was on my mind as I left my job, and continues to be, so here goes...I don't know where Loy sleeps. I don't know where Loy eats. Maybe she squats, maybe she couchsurfs, maybe she sleeps under a porch! But I know she doesn't own a house, and she doesn't work a job, yet she's always taken care of. A couple weeks ago someone asked Loy whether she gardened. Loy asked me why she would when the earth gardens for her. This is a mindset that I've been striving to teach myself and trust in—that I'll be taken care of and provided for. Minimalism can teach us not to rely on stuff for emotional support. It can also open the door for and teach us not to cling desperately to a 9-to-5 or a part-time retail job for dear, dear survival. Survival comes naturally to us, it doesn't need to be something we scramble and fight for. Tammy: Books have changed my life for the better and I’m a big book geek. I’m always curious about what other folks are currently reading. What books have you read recently and do you have any recommendations? Chloe: Oh my. I'm first going to recommend Fight Club by Chuck Palahniuk! Heh. Most people think of it as that rebellious, teenage-boy, 90s film, which is true. But besides being fun and hilarious, it's got a bunch of minimalist, anti-consumerist ideals behind it. And that really excites me! Something I'm reading now that I highly recommend is the Power of Less by Leo Babauta. I'm beginning to think of it as the minimalist Bible. Everett Bogue's The Art of Being Minimalist is also fantastic. Unrelated to minimalism, the most exciting books I've read recently are One Fish, Two Fish by Dr. Seuss, Gödel's Proof [for the math nerds out there], and something I'm perpetually reading through, The Lost Lunar Baedeker by my heavenly goddess of poetry, Mina Loy! Chloe: It's certainly not accents or imitating people. I'm terrible at that. But I have a keen knack for cloud watching. I write in Gregg shorthand. And I recently discovered that I can smile for the sake of smiling, and laugh for the sake of laughing at any time, any place, any where! Smiling for smiling's sake and laughing for laughing's isn't something I see many people doing, so I assume it must be a superpower...but I suspect it's teachable and it's something I write about every couple weeks. Tammy: What brings you the most happiness in life? Chloe: I don't know the answer yet. I suspect at this point that it has something to do with other peoples' happiness, chocolate, and holding on to fewer things and emotions so that I can move around on Earth less hindered. I'll be exploring each of these three ruthlessly this summer. Thank you so kindly for having me Tammy! And thanks to all my fellow RowdyReaders for reading to the end : ) you're adorable!